“Straight from the cask”, is the enticing claim from the packaging of this highly renowned Speyside malt. That’s a bit misleading though, isn’t it? Because A’Bunadh is a no age statement expression, said (by Wikipedia) to be blended from spirit aged between 5 and 25 years. So what cask is it bottled straight from, then? Not the one it was aged in – I mean, I presume there was some kind of marrying process, otherwise they would’ve had to take a bottle round all the various casks, fill it up a little from each, then shake it up. I suspect it just means ‘no water added’ – so it’s just a fancy way of saying ‘cask strength’ that makes it sound like it is single cask. When it isn’t. Well, let’s leave that aside. What else is there to know about this expression? It is released in batches, is non-chill filtered, aged exclusively in Spanish Oloroso sherry casks, and bottled at a varying cask strength – this one a stroke inducing 60.7%. My procurement matrix had determined that it was time to buy a cask strength Speyside malt, and Aberlour A’bunadh’s reputation and its inclusion in 101 Whiskies to Try Before You Die gave it the edge. 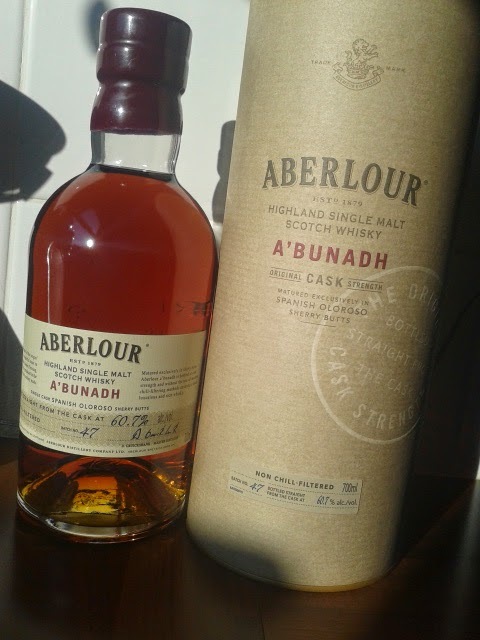 I paid just under £40 plus P&P from The Whisky Exchange. It is presented in a cardboard tube, inside which you’ll find an elegant bottle that doesn’t actually look like it’s big enough to hold the full 70cl. It is topped with an oversized cork and sealed with a deep-red waxy seal. The contents gleam a beautiful deep red colour. 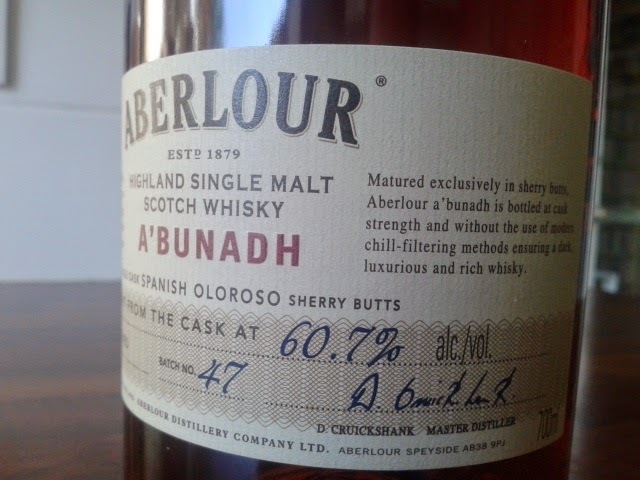 My previous experience of Aberlour consists only of the 10 year old, which I remember was classy and luxurious in its composition, but a little disappointing in flavour. I always felt it could [should] have been so much more. So I struggled with the seal (don’t trim your finger nails before reaching for this one), popped the cork and poured a glass. …aaaaaaand, first impressions were that it does wear its extreme strength very well. I don’t feel dizzy from the nosing and my nose hairs [sadly] remain unburnt – no need to cancel that order for tweezers after all. And on the palate, yes there is burn, but it is indeed palatable in its natural state. There is burn, but it doesn’t taste burnt. I began to add drops of water in any case. With each drop, more emerged, the solution sweetened and brightened and, ultimately, I ended up adding quite a lot of water before it reached the critical point at which I felt any more might be detrimental – in fact it is so strong and takes so much water that you end up with a really big drink – which is even better. So I wouldn’t say I agree that it is best without. You can drink it at cask strength, but only for a couple of sips per glass before I’d say you’re wasting it. Where does it fit in though, in the general scheme of er… whisky? Well, once again I find myself in the position of wondering why I’m not more impressed than I am. So many good reviews, so highly rated and yet… it’s all right, but it doesn’t blow my mind. There have been moments when I have enjoyed a glass very much, but those have been rare in comparison to moments when I’ve remained unmoved. Does this mean anything? Am I just expecting too much? It is only a sensory experience after all. I have to remind myself that my opinion of the Aberlour 10 and indeed Speyside malts in general has tended to be “nonplussed”. A quick glance at my geeky spreadsheet reveals that in the simple “Like” column for the Aberlour 10, I’ve actually written ‘no’. It was a while ago, but I suspect my thinking was that while I didn’t actively dislike it, in a scale that included only the variables “like” and “dislike”, it seemed a bit unfair to belittle the efforts of malts that had genuinely impressed me by categorising it alongside them. I see I’ve also etched “no” next to the Glenlivet 12. I’ve then dismantled the scale altogether to register the fact that I hated the Glen Moray classic. I’m nothing if not inconsistent. Elsewhere in terms of Speyside however, the Glenfiddich 12, Glenfiddich 15 Solera Vat, Balvenie 12 Double Wood, Mortlach 15 and Strathisla 12 have all met with a general approval, yet in spite of that, in no single case have I been remarkably impressed. It is hard to decide at this point where the A’bunadh would sit on the overall single malt hierarchy. It does have the potential to at least place higher than all the other Speysiders, but I am going to need a little more from it before I make a decision like that. So can you take anything away from this? Certainly if you already like Aberlour or Speyside in general – and perhaps veer more toward the sherried stylings of the Balvenie or Strathisla, you can conclude that this is an avenue to divert some future pennies down. Let’s face it, it is beautifully packaged, it’s an impressive strength, and it’s terrific value. There’s also a chance of course that the next batch might be better – though there’s nothing about this one that would suggest it is a bad or even unexceptional batch. No, my feeling is it just ain’t quite my thing, so it’s unlikely I’ll buy myself another one, but I’d definitely consider it as a gift for someone else. And that’s ok. What’s next? Since writing that I have finished the bottle and would just like to add a note without impinging too much on the integrity of the prose above. I stand by everything I said up there but feel it is worth mentioning that the bottle seemed to outstay its welcome. And by that, I mean I was ready to be finished with it about four large glasses from the end, at which point I pulled it out of the cupboard more frequently and even chugged down the final glass. Oddly, I enjoyed that last glass quite a lot. I wouldn’t normally treat a glass of single malt with such abandon, but there you go.